Neurogenic Heart Lesions reviews the main publications concerned with the problem of neurogenic lesions of the heart. 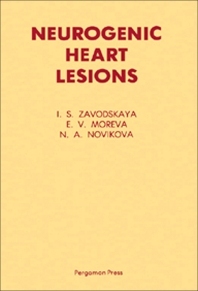 The book describes the methods for producing experimental neurogenic lesions, as well as the pharmacological analysis of the participation of the sympathetic nervous system and its transmitters in the development of neurogenic lesions of the myocardium. The text also discusses the changes in energy metabolism and in functional conditions of the myocardium caused by neurogenic lesions; and the pharmacoprophylaxis and pharmacotherapy of the biochemical changes produced by neurogenic lesions of the myocardium. Pharmacologists, pathologists, and other clinicians and physicians concerned with the new achievements in the field of cardiology will find the book invaluable.